We’re back with another culture-focused episode. 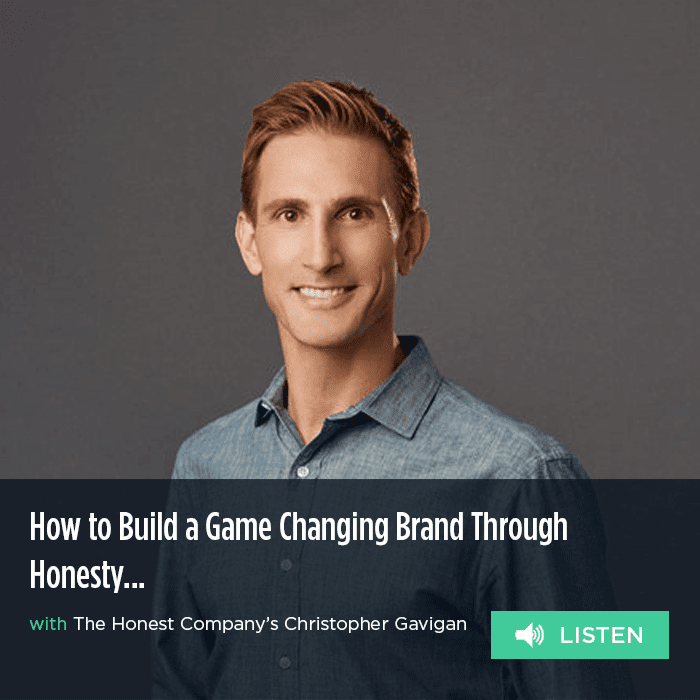 This time we bring you a conversation with Honest Company co-founder and CPO (that’s Chief Purpose Officer) Christopher Gavigan. Believe it or not, Christopher doesn’t run a CPG brand. That’s because the energetic co-founder considers Honest – the makers of beautifully designed, environmentally friendly, and unquestionably safe household products for parents and kids – to be a “portfolio of trust” rather than a typical consumer goods label. Nomenclature aside, there’s no denying that the company has experienced an astounding trajectory. Christopher and partners Jessica Alba and Brian Lee launched the company in in 2011 with just 17 products that were all geared toward the young mother. Today, the company sells more than 100 products covering all aspects of the home – all of which are free from toxic ingredients and harsh chemicals. Meanwhile, the company grew from three employees to more than 500 in less than four years. Christopher talked to us about what this rocket ship ride has been like, and how they’ve managed to scale so quickly without compromising their culture or core values. Note – this interview was conducted by SnackNation CEO Sean Kelly and originally aired in 2015. Christopher tells us how his Master’s in psychology helped him build the Honest brand. Christopher explains why he believes it’s better to change behavior through knowledge and good news rather than through fear. Christopher reveals why he considers The Honest Company to be a “portfolio of trust” rather than a CPG brand. Christopher shares the two things that keep him up at night. Christopher describes what was like to scale Honest from three to 500 employees in under 4 years, and sheds light on the biggest challenges in that process. Christopher explains why he still chooses to take 30-50 customer service calls per week. Finally, Christopher tells us why he gets all his work done between the hours of 10 p.m. and 2 a.m.
Have an idea for the show? Drop us a line! Brandbuilder@snacknation.com. Brand Builder is a co-production of SnackNation and ForceBrands. Jeff Murphy is the Director of Communications at SnackNation. He's obsessed with helping you create an Awesome Office. Brand Builder brings you the people, stories, and lessons learned from the most innovative brands in the world. Presented by SnackNation and ForceBrands.